In case you missed it, a new Gears game is coming out next week. Gears of War: Judgement totally snuck up on me. I guess that's what happens when you age out of the target demo. I don't watch the right shows to see the ads and the Xbox 360 dashboard has become nothing but white noise to me. It's actually rather pleasant. The youngsters are telling me this chapter in the Gears saga is a prequel focusing on Baird and Cole Train. Wait, Baird? Really? Okay then. I can honestly say I'm not that jazzed about about a Baird/Cole Train adventure. The whiner and the screamer. Oh boy. Maybe the launch trailer will get my hype juices flowing. Or maybe this game needs to get the hell off my lawn. Let's take a look. God, I'm easy. That looked pretty damn cool -- at least cool enough for me to want to see more. Oh look, here's a bunch of weapons videos. I love weapons videos. @#$!ing love 'em. The Markza. A sniper rifle that doesn't have anything sharp or pointy attached to it? Blasphemy. Still, it seems to do a fine job of cracking coconuts. The Breechshot. Now that's what I'm talking about. A gun just isn't a gun unless someone's duck taped an ax to it. The Tripwire Crossbow. It doesn't matter which part of your enemy's body touches the infrared beam; all four limbs are popping off. It's science. The only thing I don't like about these gameplay videos is that they don't feature entire bro-packs somersaulting everywhere while spamming Gnasher fire. Because, well, that's all I've ever seen in Gears multiplayer. No big deal. I do love playing through the campaign with some co-op pals. 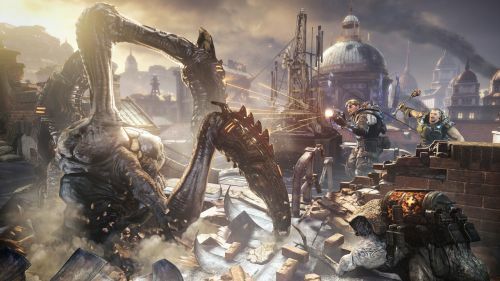 Gears of War: Judgement supports two player local co-op and four player online co-op. It will launch on March 19th exclusively for the Xbox 360.